Articles from Dr Fox related to cystitis (information, advice, and treatment options). Sadly, cystitis is incredibly common in women. Around 10–20% will get at least one attack of cystitis in a lifetime. The symptoms can be extremely unpleasant, and you may be desperate for help – and fast. Some women have recurrent urine infections, which can be very troublesome and annoying. This information below is only for women with a suspected urine infection, and for stand-by non-urgent antibiotics. If men think they may have a urine infection, this needs a totally different approach. Read on to find out all you need to know about urinary tract infection, antibiotics and stand-by treatment. Are you curious about your urine? Just exactly what is urine? Where does urine come from? What does our urine tell us about our general health? Nitrofurantoin (MacroBID) is now available to women to buy online from Dr Fox in advance, ready for when needed. 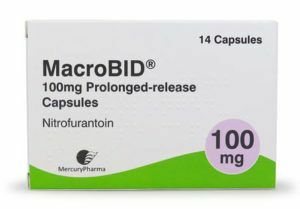 Nitrofurantoin is an antibiotic commonly used to treat uncomplicated cystitis. In the past few years nitrofurantoin has replaced trimethoprim as the first line treatment for cystitis. Cystitis and thrush are not normally serious health conditions, and can be treated with relative ease. A quick round of antibiotics can clear up cystitis, while vaginal thrush can be treated with a single-dose capsule, pessaries or cream. But, anyone who suffers from recurring episodes from either of these conditions can attest that it’s never fun to feel the first pangs of an infection coming on. They can be painful, and it’s a ‘pain’ to have to locate the medicines to treat them. If you’re plagued by cystitis you know the symptoms all too well – the burning, stinging feeling when you pass water, the urgency to use the toilet and needing to go more frequently. Cystitis can be a very embarrassing and painful condition, however if you’ve been suffering from cystitis it may be reassuring to know that you’re not alone. In fact cystitis affects nearly every woman during her lifetime, with around 1 in 5 experiencing recurrent episodes. Cystitis is inflammation of the bladder and is usually a mild condition, although it sometimes requires antibiotic treatment to bring it under control. However, occasionally the infection can travel up into the kidneys, so it’s important to be aware of what the typical symptoms of cystitis are. The most common symptom of cystitis is pain while passing water. This can vary from a slight discomfort to a burning sting. It can also create the feeling of needing to use the toilet frequently and urine may be cloudy and blood stained. Cystitis is caused by infection in the urine. Active medical treatment of cystitis usually involves taking an antibiotic. Most of the infections causing cystitis in the UK are cured with the antibiotic trimethoprim. There is some antibiotic resistance to trimethoprim, however it remains effective in 90% of cases. 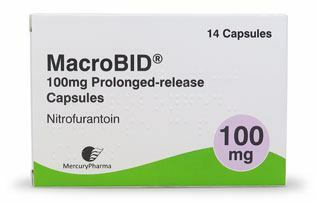 Update (Dec 2017): Approximately 30% of cystitis infections in the UK are now resistant to trimethoprim – nitrofurantoin (MacroBID) is no first choice treatment.